According to our sources, the house has been built 1910 by the bank directory Ingemansson, whose son, as I wrote in a previous post, was a "prominent" figure in the Lund political scene. His name was Hans Ingemansson. With these hints, and finding the name "Greta" carved in a door frame in one of the small bedrooms, I made few searches and found some information. Axel Ingemansson was very active. Not only he built our house, but he was first tenor in the Lund Studentsångare under Fader Berg and member of the Odd Fellow organization. 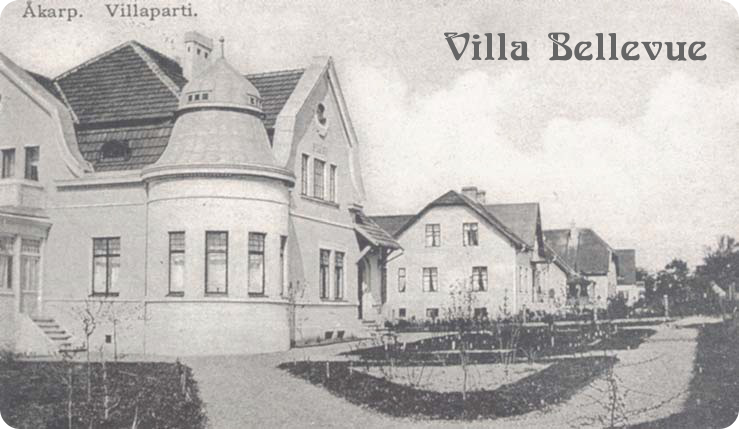 Born 1876, he moved out of Kullavägen in 1939, it seems, when he bought a building in Lund, Kastanjen 6. He married Anna Nilsson and had two kids, as mentioned: Greta, born 1899 (who married a bankman, Åkaeson) and Hans, born 1905. Hans Axel was born the 2nd of April 1905 and was mainly a lawyer and during the 60s he was "kommunalråd". He had three kids, Carl-Axel, Barbro and Eva from Ebba Johnson (who he married 1931), but married again 1958 with Gulli Castler. I don't know how long he lived in our house, but at a certain point of his life he was living in "the most beautiful house of Lund", which is the old pharmacy building (apotekhuset).